This homemade costume for men entered our 2014 Halloween Costume Contest. 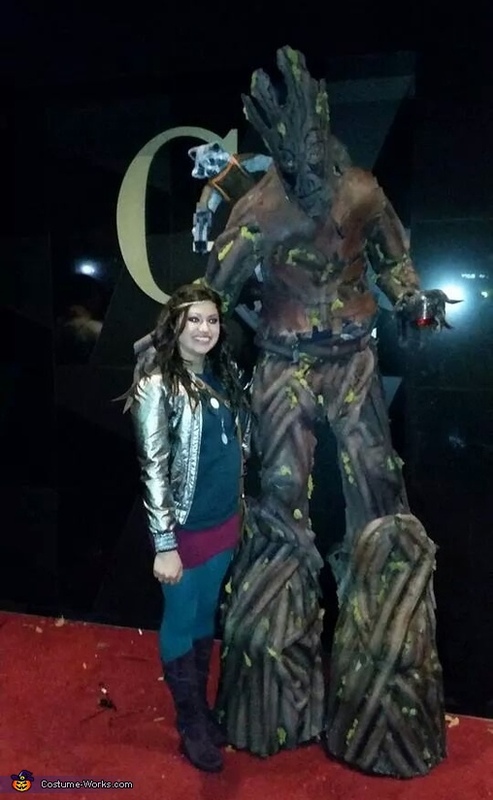 After seeing the hit film Guardians of the Galaxy my brother said that Groot would make a pretty cool costume. I excepted the challenge and convinced my friend Chris to let me build it for him to wear being that he is over 6' tall. Started by making a duct tape mannequin to work on and applied cut pieces of foam pipe insulation over an Under Armor body suit. Applied tissue paper soaked in glue over the insulation for texture. To make him the giant he is we fabricated some stilts out of some work boots secured to five gal buckets. The mask was constructed out of a piece of foam flooring. Groot companion Rocket Raccoon is a paper mache armature with a thin sculpted layer of clay. A couple of cans of spray paint and some moss from the hobby store later and walla, the treeman lives!